Fantarella Dental Group offers a full array of dental services to help you maintain healthy teeth. You can read more on this page about specific services. Crowns are synthetic caps, usually made of a material-like porcelain, placed on the top of a tooth. They are used to replace large fillings, protect weak teeth from fracturing, fix a fractured tooth or cover a tooth that has had a root canal or a dental implant. Using our advanced CAD/CAM technology, this is done on-site and in a single visit. Also produced by CAD/CAM, bridges are custom-made appliances that can replace missing teeth in both appearance and in function. Dentures are removable replacements for missing teeth and surrounding tissues. These are custom devices that either replace some or all the teeth while restoring your smile and mouth function. A dental implant is an ideal tooth restoration for people who are missing one or more teeth because of injury, periodontal disease, or any other reason. The implants themselves are tiny titanium posts that are surgically placed into the jawbone where teeth are missing. Our doctors are experts in placing implants and restoring them with crowns that look and feel like natural teeth. Whitening can be used to treat stained and discolored teeth, or simply to enhance a dull smile. This can be done in the office with a laser or done at home using plastic trays and a whitening gel worn for short periods of time. Sealants are used to fill in narrow grooves in a tooth that cannot be adequately cleaned by brushing. These sealants help prevent cavities in the grooves and pits. Root canals are performed when a cavity and infection reaches all the way to the pulp of the tooth. This is diagnosed in our office. A root canal cleans out the infected pulp and the canal is filled to prevent further infection. 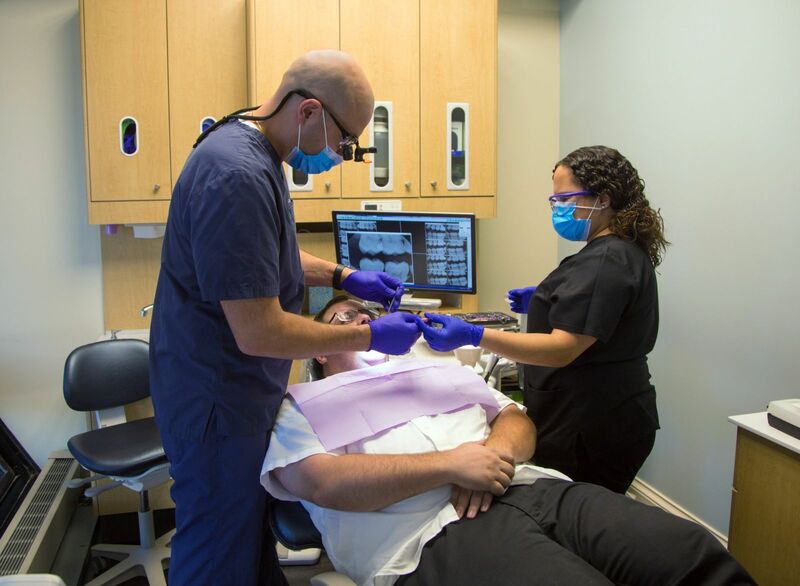 Most patients who have root canal experience little or no discomfort or pain, and enjoy a restored tooth that can last almost as the original tooth. Sometimes due to severe decay, infection, or fractures, teeth must be extracted or removed. We can do this in the office, often the same day as your exam. The Invisalign treatment is an alternative to traditional braces for fixing crooked, malaligned teeth, but since the trays are made of clear plastic, they are virtually invisible. In addition, because Invisalign trays are removable, they can be taken out while eating, drinking, brushing and flossing.